I’ve picked up an iPad (and hopefully several more for some other folks) here in San Francisco, and decided to test it out on a host of sites. Some pass, some fail and some need some work. 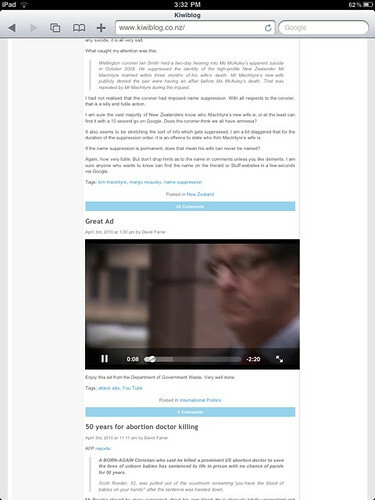 This is a page mainly full of screenshots, and mainly of interest to those that work on the sites. So I’ve hidden most of it under the fold. But forget about moving the page around – not that I ever do anyway. Note the advertisement served to me here in the USA – it’s for the Kindle, but it is aimed at those travelling overseas. The Kindle is STILL unavailable in New Zealand – but the iPad will be. 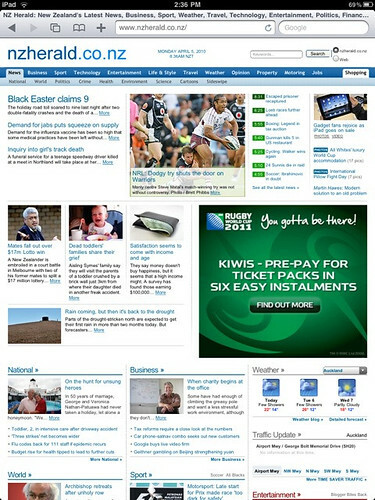 NZHerald’s site looks and worked fine. 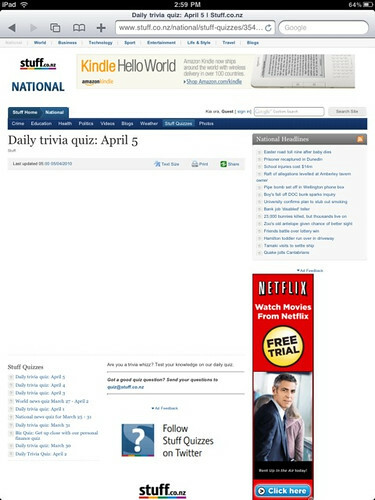 For both sites if there were flash advertisements then they failed gracefully. The iPad lets you zoom right in really quickly – and images can look pretty jaggy when you do so. This is solveable, but perhaps at the expense of even heavier pages. 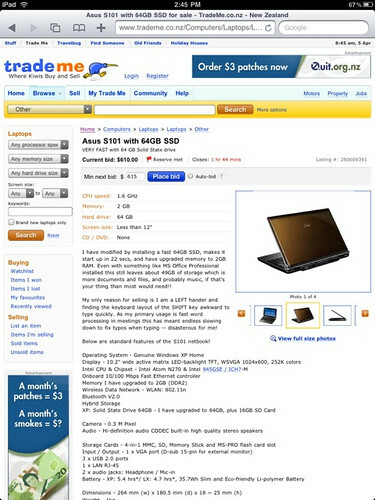 Trade Me delivered the mobile version – wrong move, but it should be easy to change to default to the normal site. 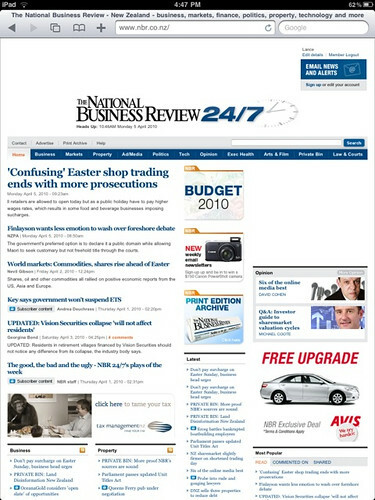 AFR.com.au shows the mobile site – and then offers no way at all to view the normal site. 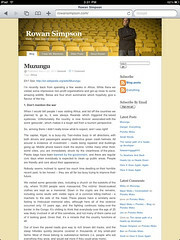 It’s not a Kiwi site but I had to put it in for the epic Fail. Valuecruncher worked – but it was a bit fiddly to operate the controls at times. 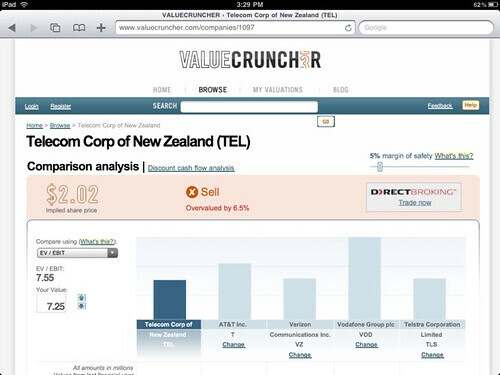 Valuecruncher shareholder Rowan’s blog was fine – as are all WordPress.com blogs, including this one. 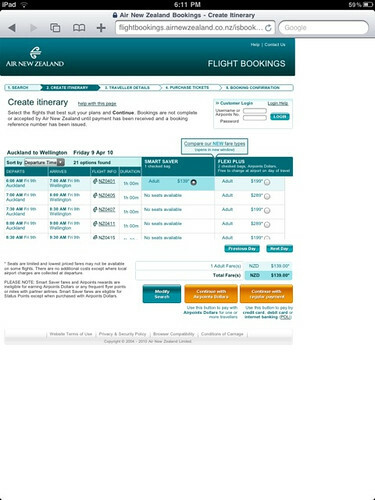 But Air NZ needs some work. The flight search process was messy. 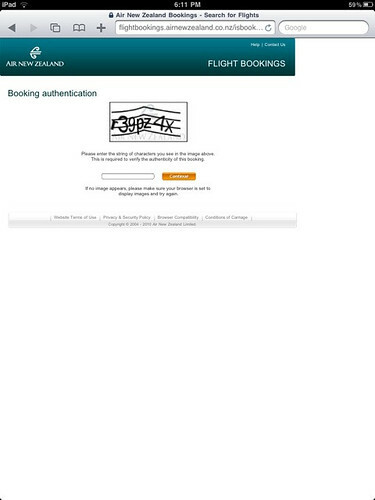 Here the name of the arrival city is overlapped by the dates – meaning that I got the city wrong. scrollable box, but displayed down the page. Oh – and while I am griping about my favorite airline – why can’t I book cuddle class yet? I’m in San Francisco and wanting to show friends that thay can now sleep on the way here. So there you have it. Overall the iPad seems to surf just fine, but it’s not proving great for useful work yet. I had to write this post on my laptop – a mac of course. <update – I somehow didn’t successfully grab the idealog screenshots – here they are. 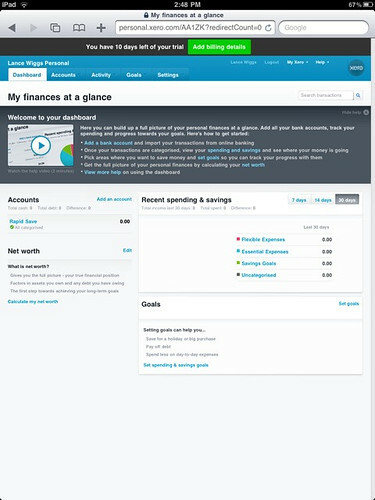 The home page looks ok- except for no flash ads of course. 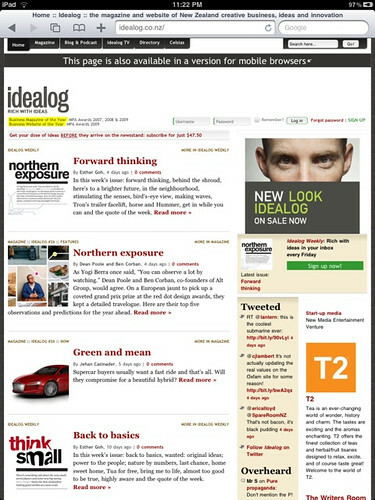 The nice thing about idealog is that they offer to show a mobile site – here it is, but it is not much use to me on the giant iPad. 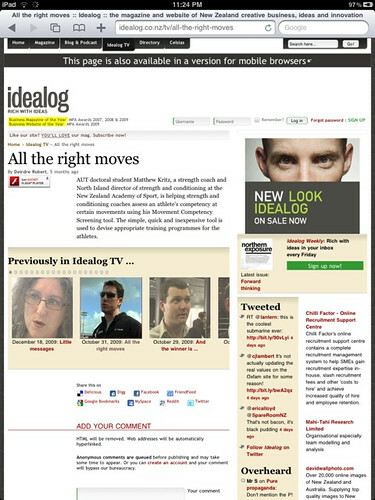 Idealog TV completely fails – see the Flash error under the first article title. Clicking on the “previously…” tiles has no effect. 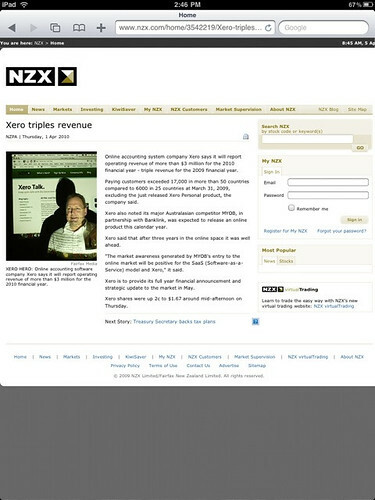 You didn’t look at xtra dot co dot nz, which used to be NZs most popular website, not too long ago. 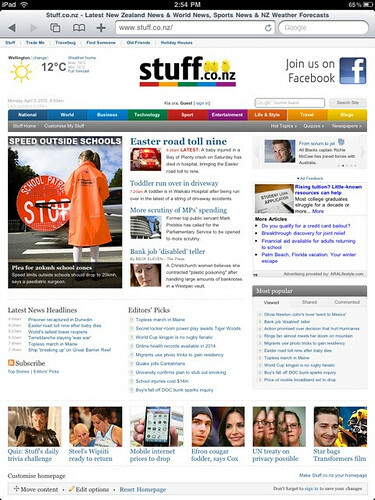 Also MSN NZ and microsoft wouldbe interesting, as they probably use silverlight. 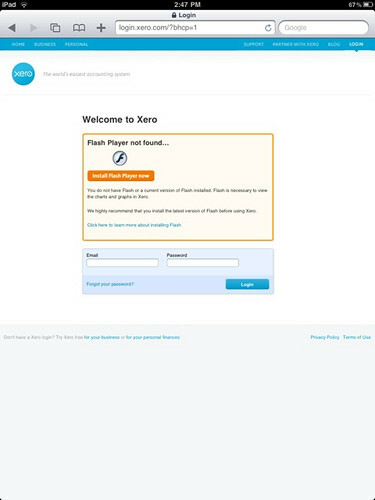 Bit of a worry that xero doesn’t work, as I thought there advertising was’ Anywhere anytime’ or something like that. It would be the perfect type of device for using an online accounting system on if it worked. 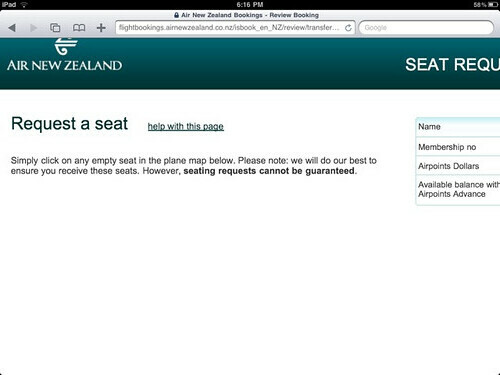 MyAirNZ and grab-a-seat are flash-based to avoid web bots ‘scraping’ content and not for user-experience. Unlikely they’d “improve” on that. Thats the problem with the ipad, if it doesn’t have flash, then it isn’t a fully featured web browser. HTML5 is OK for videos and flash like image effects, but I don’t know about as a full flash replacement. I guess W3C have made flash a ‘web standard’ then eh? No, it’s just websites pandering to a global monopoly (Adobe Systems Incorporated) that’s the problem. HTML 5 will do the trick just nicely thanks. 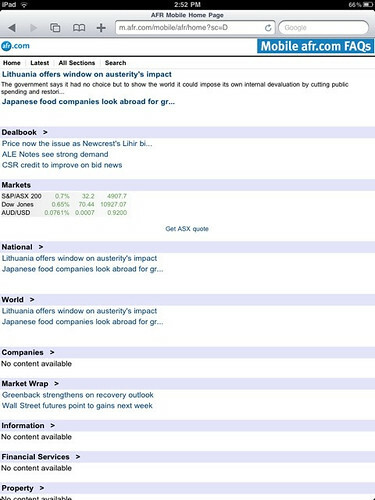 @iGus HTML 5 isn’t a standard either yet. 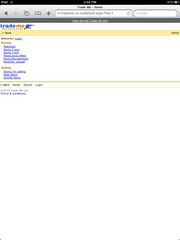 Flash maybe owned by adobe, but then again things like google maps, analytics and other google stuff that web designers put on their customers websites, are also owned by google, a global monopoly.Also don’t be surprised to see google eliminated from the ipad, due to apple and googles recent rift, and we may see bing instead. Actually Grabaseat is no longer Flash and it wasn’t the Flash that stopped screen scraping – it was the encyption on the XML feed. 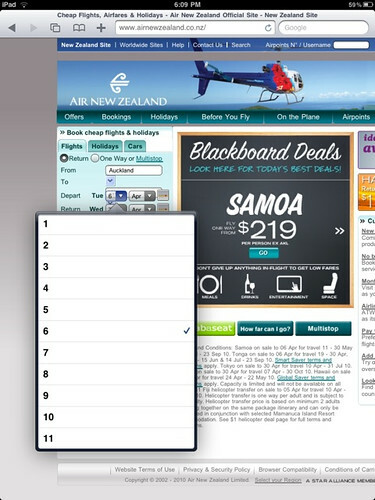 The MyAirNZ site has no reason to be Flash. It is a horrible piece of junk. I have no idea why they put this out. @Rob Both Xero & Xero Personal work great on the iPad (as can be seen in my blog post over at the Xero blog: http://blog.xero.com/2010/04/i-have-an-ipad/). There are some kinks to work out but the current dependence on Flash is only for the graphs so everything else works as expected (bank rec is especially fun). Anyone that’s seriously played with HTML5 knows that it’s not yet a standard that’s supported equally by every browser. Therefore it’s not just a matter of switching out one technology for another. But we are working on it (though initially it will be specifically to support mobile devices like the iPhone & iPad). The iPad is an amazing device (I’m typing this comment on mine right now) & no one is more excited than Xero about the possibilities it brings. Very exciting times! Thanks for your post. 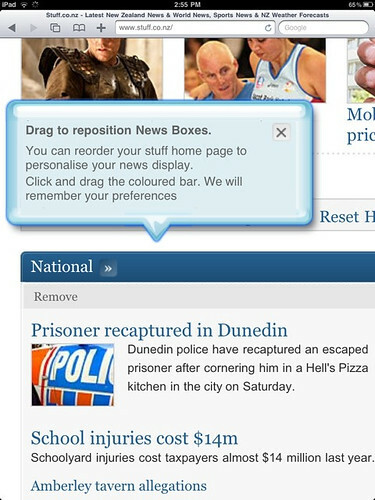 We’ve just released a fix so Trade Me will not auto-redirect the iPad to our mobile site. I like my ipad mini, aka ipod touch. Does a lot of what the ipad does, but I can take it with me in my pocket. Given that iPad is not available and on your own account it’s yet to be clear just what it’s good for, it would seem unlikely that any of the above would have bothered to configure for it. So why beat them up? I’m not beating them up – this was more to show site owners back here what they had not yet seen. 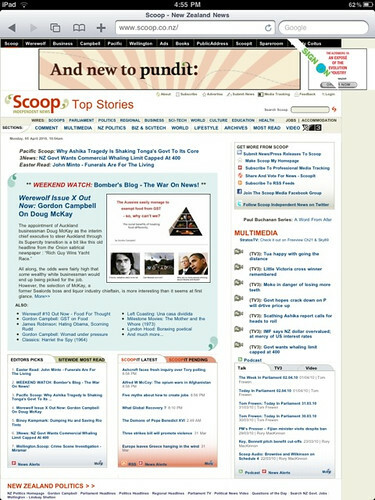 The beat up is where sites have poor usability that is magnified with the iPad. 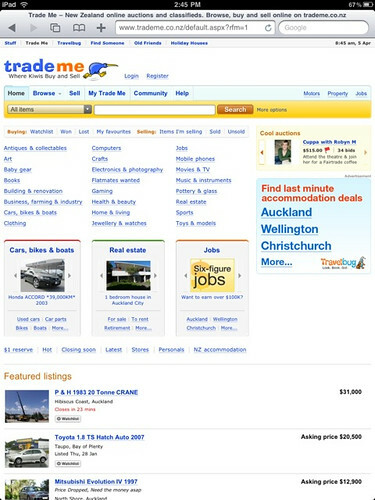 Trade Me changed their site almost immediately – have any others responded? How has your site responded? With over 1 million ipads sold in the first month its clear that companies and their web developers need to be taking the platform into consideration. Regardless of how one feels about the usefulness of the device it will become impossible to ignore when making choices around the most appropriate technology to deploy when developing new sites or online applications. 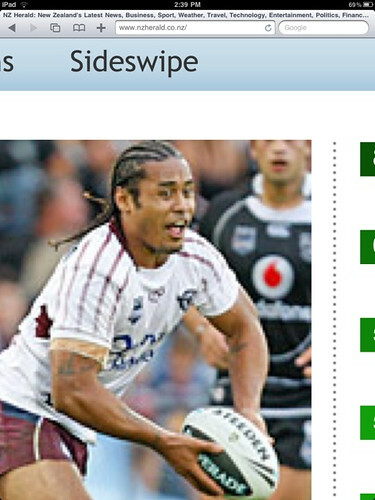 Thanks for the article Lance, its a useful read. Nice overview hut not sure how many iPads would have to be in market before you started changing home pages to optimize for them. 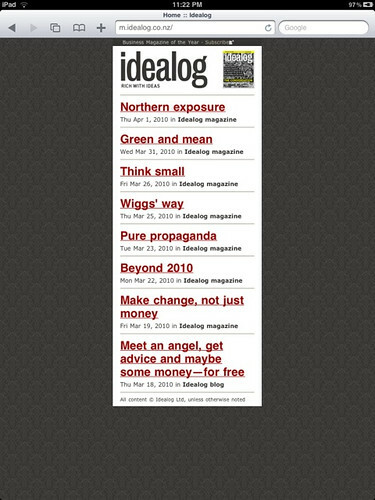 What is really interesting to me is how many news orgs are creating iPad experiences that mimic the paper. WSJ and NYT for example. It will be interesting to see whether this becomes the norm, or whether people will design more specifically for the strengths (and weaknesses) of the device.